Marcus Walz has dedicated his life to racing, designing and building motorcycles from his base in Hockenheim Germany and it’s fair to say he hasn’t gone unnoticed. He’s been featured on TV, in Magazines around the globe, won both the European and US Biker Build Offs and raced both on track and on the dirt. 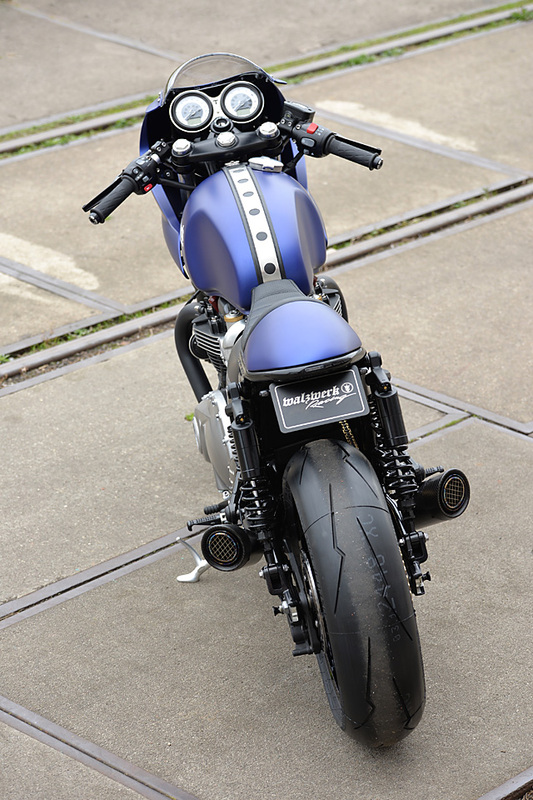 So good are his custom creations that men who know a little something about going fast, Sebastian Vettel and David Coulthard own his bikes and Kimi Raikkonen owns two. Brad Pitt has been a fan for more than a decade, there is a restaurant and bar sporting his name and the likes of Yamaha and Ducati have had him build custom bikes for them. 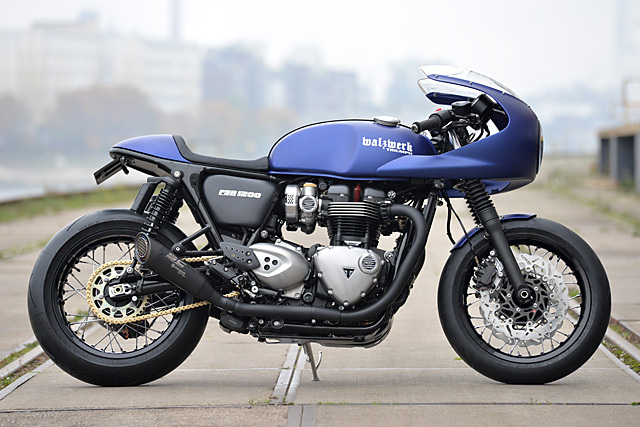 So it should come as no surprise that Triumph has joined the crew and the result is this stunning new WalzWerk 2016 Triumph Thruxton 1200 custom. 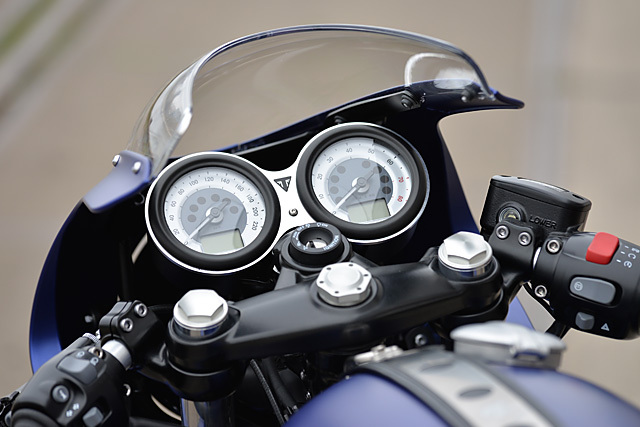 The all new Thruxton is one of the most anticipated bikes to come to the market in years, not only was it part of Triumph’s big release of now water-cooled twins for their modern classic range it’s also one of the few retro remakes from any of the major manufacturers that puts performance at the top of the to do list. 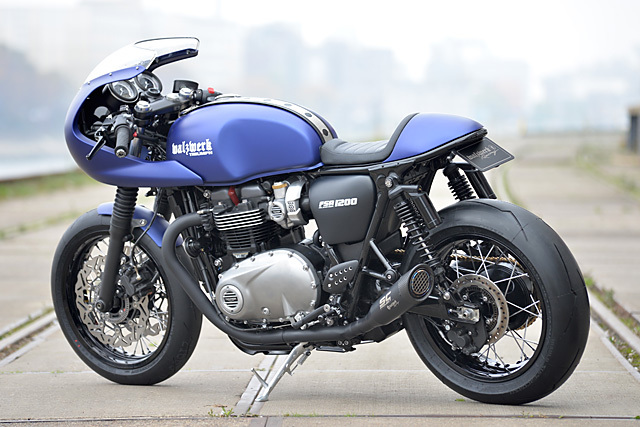 The Thruxton name is an important part of Cafe Racer folklore, named after a British race track, an original factory racer and used by the Cafe set both on the street and at the track with men in back alleys building their names as famous tuners of the classic British twin. Now with a global appeal and in preparation for the huge INTERMOT show in Cologne it made perfect sense to see what customiser extraordinaire Walz could do with the all new machine. With delivery of a new bike to his headquarters at WalzWerk-Racing it was time to strip her down and build it back up in the signature Walz style. Interestingly enough Walz didn’t want the R-spec model with all the extra big dollar components, “I think the bike looks much more classic with the conventional standard forks.” But to start the build it wouldn’t look like anything at all as the all new bike was taken back to a completely bare frame so that absolutely every little detail could be taken care of. Having no desire for the large overhanging factory rear fender the frame was cut back substantially and a new rear hoop welded in that takes a good foot off the visual length of the bike. To ensure a factory finish was maintained with the chassis work taken care of, it was out for a whole new layer of smooth black powder coat. One thing that has always kept Walz bikes on the map, be they wild or mild, is the high quality metal work and the tail section is yet another example, hand beaten from a single piece of aluminium. It perfectly follows the lines of the new subframe and together with the new under seat support and plate holder creates a tidy rear end. Interestingly enough Walz didn’t want the R spec model with all the extra big dollar components, “I think the bike looks much more classic with the conventional standard forks.” But to start the build it wouldn’t look like anything at all as the all new bike was taken back to a completely bare frame so that absolutely every little detail could be taken care of. Having no desire for the large overhanging factory rear fender the frame was cut back substantially and a new rear hoop welded in that takes a good foot off the visual length of the bike. “The whole rear section is now extremely narrow which gives the bike a total new look when you look from behind.” explains Marcus about his handy work. The factory side covers didn’t work at all with this new look and were too big for Walz’s liking so more aluminium was bashed into shape to fill the triangle shape in the frame with a slimmer profile cover that tapers to the rear. 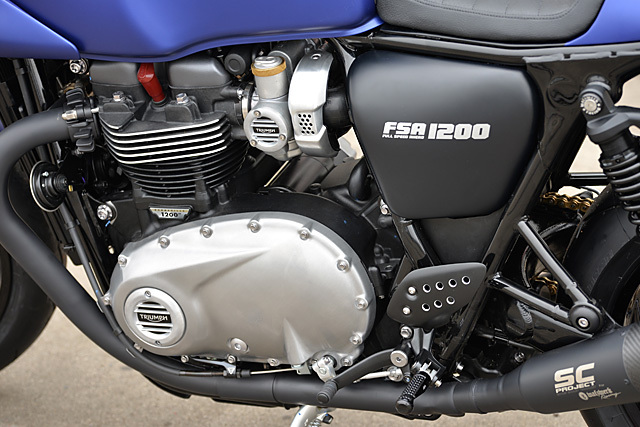 “For the front, we took the fairing which Triumph offers in their parts & accessory catalogue. But when it arrived, we noticed it was huge like the stock side panels. So we cut it here & there to make it more narrow, modified the fairing bracket so the fairing itself comes a bit more down. At the end we were pretty much satisfied with how the fairing came out. 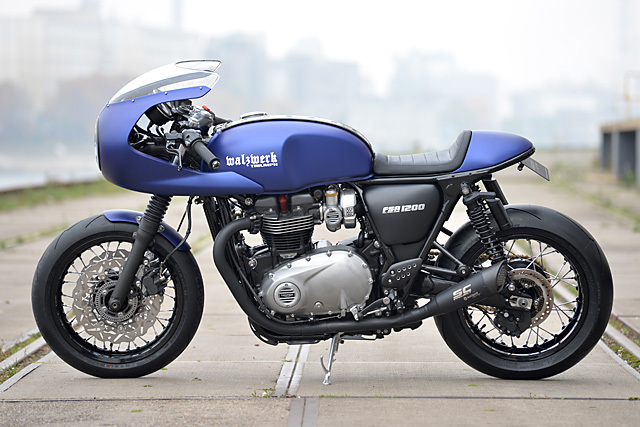 It now really matches the bike perfect in any angle.” Finally to complete the body work a new aluminium front fender was fabricated that maintains the minimalist approach and new mounts allow it to be bolted up to the forks. The matte paint finish has been used by Walz off and on over the years and the purple tinged blue shows off the flawless bodywork brilliantly! WalzWerk Triumph graphics on the tank and FSA 1200 badging on the side covers gives a little racers touch and the tank strap, made from punched alloy and leather, wears Walz’s signature embossed into the metal. 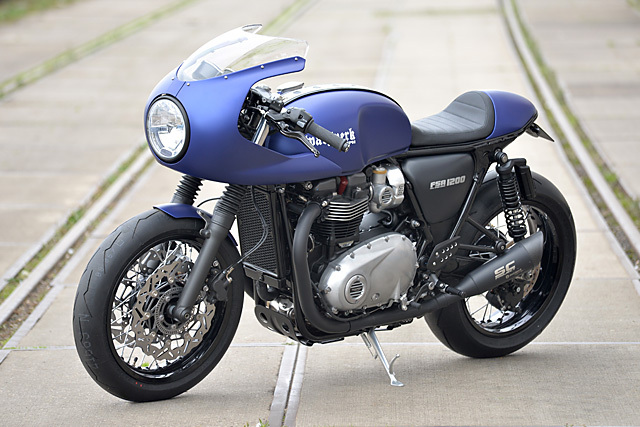 The new seat covered in black leather is strictly for a solo ride like any good Thruxton and the simple colour palette chosen for the build works perfectly with the classic lines. To keep anything from interfering with that look the rear taillight is an LED unit that has been frenched into the rear frames new hoop for a flush finish. So that there is nothing poking out of the sides the numberplate holder is kept small and tiny turn signals are fitted to its side that are barely visible until the bright LEDs are illuminated. But the factory badged headlight has been kept in place, just with a matte black outer ring where chrome once called home. Although Walz had opted not to go for the R model with its fancy suspension and brake package that didn’t mean he intended to leave the bike standard. Instead the design called for maintaining the classic look while improving performance all round, so the standard telescopic forks have been fitted with 20mm lower Wilbers progressive springs. Out back it’s out with the stock shocks and in their place a set of big dollar YSS fully adjustable twin shocks that allow the experienced racer to dial in the bike to suit each rider’s needs. “The wheels are from Excel, high gloss anodized with stainless spokes and converted to tubeless use, so we can run a set of Pirelli High Performance tires to use the bike sometimes also for track days. On the rear we modified the swingarm, so we can run a 180 rear tire on a 5.5’x17′ rim, stock is 160 tire on a 5′ rim.” Upgrading the brakes is not so simple with no aftermarket items yet available, so a set of fully floating wave rotors from Braking intended for a Triumph Daytona 675 were modified to fit and work in combination with a set of Pagid racing brake pads. 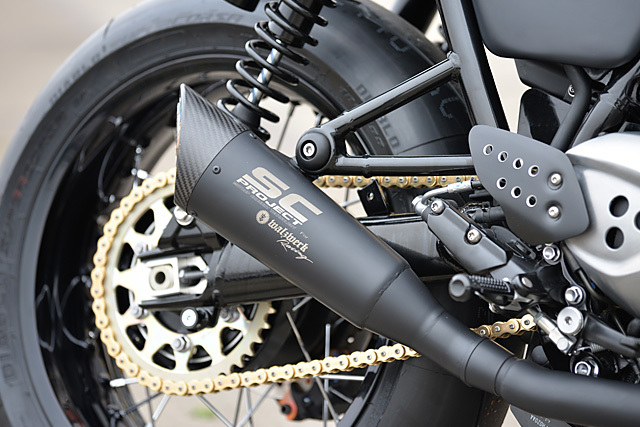 The genuine MotoGP mufflers have been fitted up to the stock header pipes with everything ceramic coated in flat black. 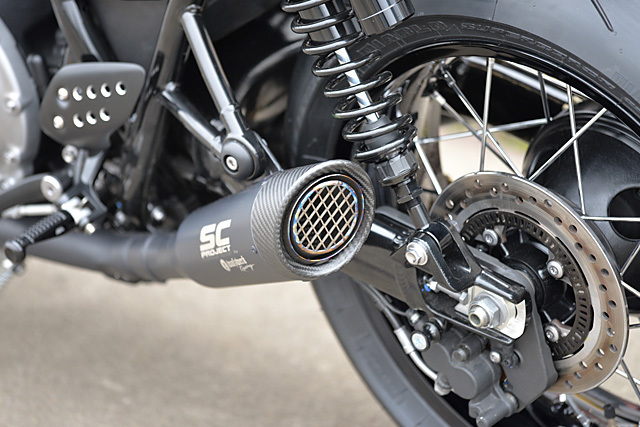 “I decided to go with those modern mufflers because I like it when you combine modern details with the classic look, but still let the classic look dominate.” With the addition of a K&N racing air filter and a fully tuned power commander V, power is now 110hp. 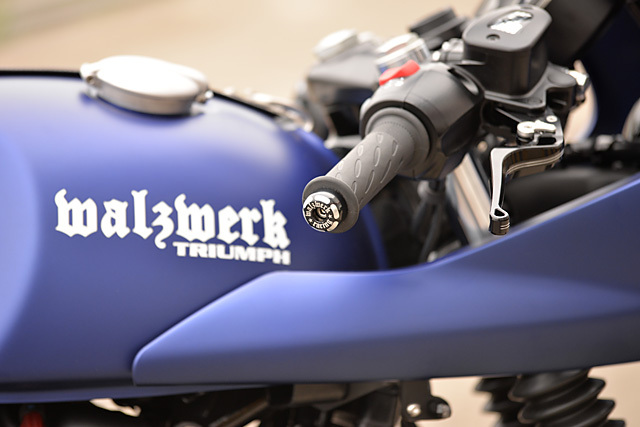 To give a racier feel to the controls the rear sets and the full adjustable brake and clutch levers are from ABM in Germany, while the handle bar weights and upper shock mounts are WalzWerk Racing production items from Walz’s extensive parts catalogue. To finish out the build the chain was switched over to a 520 EVR3 racing chain in gold with SuperSport alloy sprockets to match front and rear. “The bike drives and handles like a dream and you are really addicted to it right after one minute.” And it seems that Marcus isn’t alone, with the bike taking out top Triumph at the INTERMOT show. 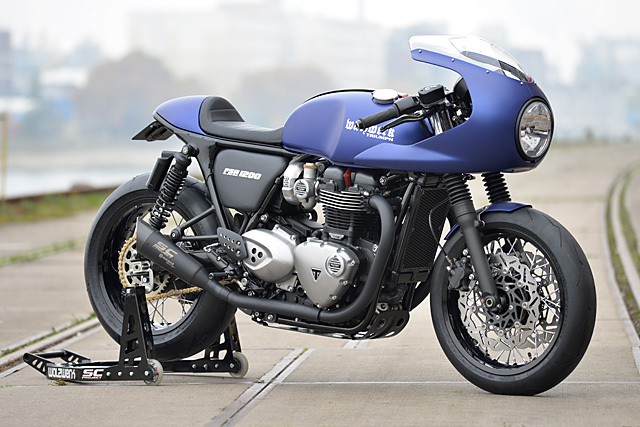 With the Thruxton having been built for no specific customer in mind and now up for sale, the only question is will you beat out a host of Formula One drivers and Hollywood actors to be the next to own a one-off Walz masterpiece?